There will never be another one quite like Chautauqua – he did everything on his own terms. That was more evident than ever in the way he bowed out, refusing to jump from the barriers. The eight-year-old exits the stage a six-time Group One winner. The track was indeed the stage for one of the greatest ‘showman’ we’ll ever see in Australian racing. The son of Encosta De Lago widened eyes, fluttered hearts and caused heads to shake in disbelief. 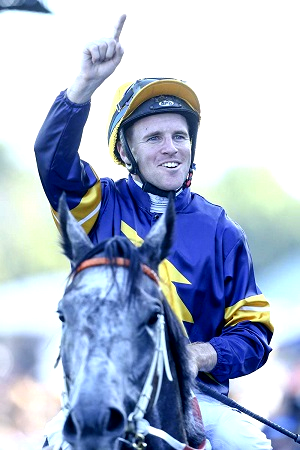 Jockey Tommy Berry knows this better than most, having piloted Chautauqua in five of those six Group One wins. Berry, who had eight rides on the Hawkes-trained gelding over his 32-start career, offered an insight into what it was like to ride ‘The Grey Flash’. “It was like everything was going in slow motion,” Berry said, “He had such a big stride and would let down with a powerful burst. Once he hit top speed he didn’t miss a beat, never dipped or dived, he had such a beautiful clean stride, it felt as if you were floating on air. Although Berry acknowledged that Chautauqua wasn’t overly too fond of him around the stables, there is no denying that the duo clicked on the track. “Anyone from the outside that wasn’t with him day in, day out, he wasn’t a fan of. He’d rather stand at the end of his box. To ride work he was pretty good but it was hard work getting him back to the stables. He’d do cartwheels, leap through the air and was so strong, he was a big athlete. That was the hardest part of riding him in his work, getting him home after it,” said Berry. The first time Berry ever sat on Chautauqua was in the 2015 TJ Smith Stakes, nabbing Lord Of The Sky on the line. He hadn’t even ridden him in work prior to that, having only recently joined the Hawkes team. “After what he did there, I thought he was a superstar. From that day onwards I had so much belief in him that no matter where I was in the run, he would pick them up. The more I rode him the more confidence I had in the horse. I just left him alone and he seemed to enjoy that,” he said. Chautauqua’s impossible third straight TJ Smith Stakes win, which was the last time Berry rode him in a race, is a memory the jockey holds onto very tightly though. “He’d run against Winx the start before (in the George Ryder Stakes) so was dropping back in trip. I knew we had a few things against us on that occasion but I went into the race thinking I was still on the best sprinter,” Berry recalls. “We’d gone 150 metres and he was back towards the inside, off the bit and not travelling very well for me. It was the first and only time I had been worried that I wasn’t going to get the job done on him. He dropped the bridle before the corner which he never really did, he normally took you into the race from the 600m. I gave him a couple reminders before the corner and he didn’t respond straight away but when I gave him a third and fourth he started to. In Chautauqua’s August race day trial, where he stepped away slowly before rattling home behind Zousain, Berry believes the champion sprinter gave him “as good a feel as he ever has”, and although his refusal to race was frustrating at the time, Berry now reflects on the episode with a smile. “Even though it was tough to take I can look back on it now and laugh, that’s the horse he has always been. He always did what he wanted to do. Even in his races, getting so far back, not going until he wanted to, his whole makeup has been like that since day one. It has worked against us for the last 12 months but I worked with it for five years,” said Berry. 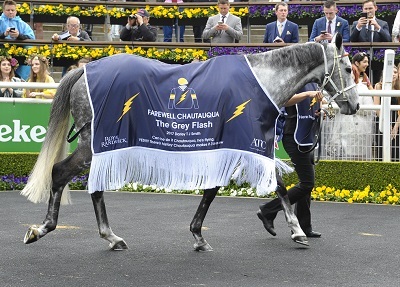 The quirky nature of Chautauqua only serves to add to his remarkable legacy and Berry, although only 27 years of age, is resigned to never riding another horse like him. “Not of his nature, no. I’ll probably sit on horses as good as him but I don’t think I’ll ever again sit on a horse that can give away a start like he could and run off his sectionals from the half mile. It’ll be very hard to find another horse like that,” he said.